The GCCI, a trailed 1-row top lifting harvester with continuous container transport system, is flexible and productive. The harvester easily takes along four boxes for 1000 kg or eight boxes for 500 kg on the container transport system. A box filler with two fall breakers allows boxes to be filled in pairs. This increases the stability and reduces the pressure on the chassis. Thanks to the innovative container transport system the driver can offload boxes while the machine is moving. The root crop is suspended uniformly and accurately in the 14,000 mm long super grip profile harvesting belts. 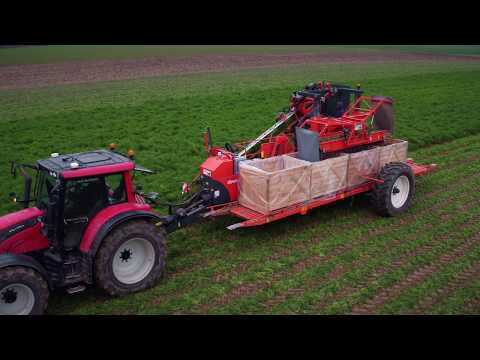 The ‘Floating Share’ is a unique feature: one harvesting element with independent harvesting share, whereby maximum stability is guaranteed, even at high driving speeds.